71 D E C E M B E R 2 018 / J A N U A R Y 2 019 THIS FORM MUST BE FILED NO LATER THAN 5 p.m. on Jan. 31, 2019, at the appropriate office listed above. Candidates are urged to return this form by cer tified mail in order to get a receipt and ensure compliance with the deadline. It is the responsibility of the candidate to ensure that this document is received by the due date and time. Please give a brief biographical sketch of no more than 30 words. (If more words are used, the information that accompanies ballots will include only the first 30 words.) If you wish your ethnic grouping to be listed, this will not count as part of the 30-word limitation. Please print. Name Cellphone Address Home phone City, Zip CTA/NEA Member ID Number Name Service Center Council Personal email address Gender Chapter I am a member of : CTA NEA M F Category: NEA Active (Non-Supervisory) Member (including Education Support Professionals) Send or fax directly to your Service Center Council (see addresses and fax numbers on facing page). Higher Education CCA Member (eligible to be in bargaining unit) Send to Community College Association, 4100 Truxel Rd., Sacramento, CA 95834. Higher Education CFA Member (eligible to be in bargaining unit) Send to California Faculty Association, 1110 K St., Sacramento, CA 95814. CTA/NEA-Retired Member (must be member of NEA-Retired) Send to CTA/NEA-Retired, c/o C4OB, P.O. Box 921, Burlingame, CA 94011-0921. Student CTA Send to Student CTA Office, CTA, P.O. Box 921, Burlingame, CA 94011-0921. Signed I am: American Indian/Alaska Native Caucasian Hispanic African American Asian Native Hawaiian/Pacific Islander I am or plan to be a declared candidate for a local delegate position also. Yes No If yes and you are elected to any delegate position (state, local, or both state and local), you are responsible for informing the Service Center Council of your choice by April 12, 2019. 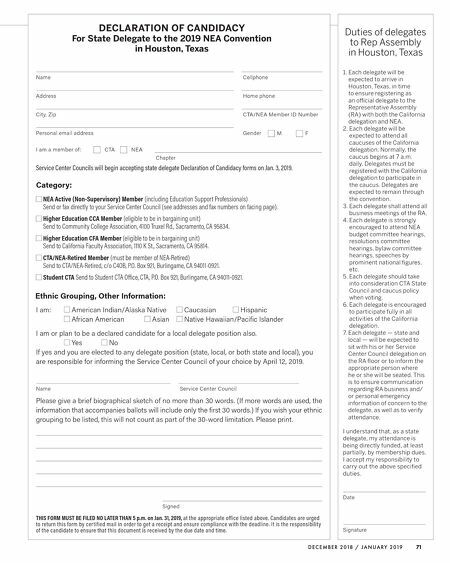 Ethnic Grouping, Other Information: DECLARATION OF CANDIDACY For State Delegate to the 2019 NEA Convention in Houston, Texas Duties of delegates to Rep Assembly in Houston, Texas 1. Each delegate will be expected to arrive in Houston, Texas, in time to ensure registering as an official delegate to the Representative Assembly (RA) with both the California delegation and NEA. 2. Each delegate will be expected to attend all caucuses of the California delegation. Normally, the caucus begins at 7 a.m. daily. Delegates must be registered with the California delegation to participate in the caucus. Delegates are expected to remain through the convention. 3. Each delegate shall attend all business meetings of the RA. 4. Each delegate is strongly encouraged to attend NEA budget committee hearings, resolutions committee hearings, bylaw committee hearings, speeches by prominent national figures, etc. 5. 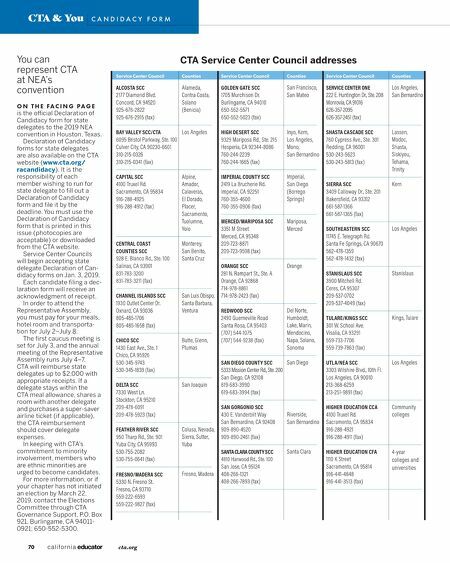 Each delegate should take into consideration CTA State Council and caucus policy when voting. 6. Each delegate is encouraged to participate fully in all activities of the California delegation. 7. Each delegate — state and local — will be expected to sit with his or her Service Center Council delegation on the RA floor or to inform the appropriate person where he or she will be seated. This is to ensure communication regarding RA business and/ or personal emergency information of concern to the delegate, as well as to verify attendance. I understand that, as a state delegate, my attendance is being directly funded, at least partially, by membership dues. I accept my responsibility to carry out the above specified duties. Date Signature Service Center Councils will begin accepting state delegate Declaration of Candidacy forms on Jan. 3, 2019.